It would not be a tad bit ornamental if i say in affirmative that by authoring his latest book ‘ Chanakya’s New Manifesto ‘ , Pavan . K . Varma has added one more golden feather to his already sparkling plumage . To brief the book in one word – Sensational ! . Let me explain the reason in detail . The blurb highlights the pulp of the content using simple yet striking array of words , which inturn engraves the motive behind the book deep in the minds of readers . India is gasping in the clutches of malice which , shocking enough , has succeeded more or less in conquering every which lane of our country with its egregious act and the blurb acts to blow the trumpet as a wake up call to snap awake the people of our country from their long dreary slumber . The book starts off with a prologue where the author painstakingly explains in detail the impetus behind the specific title of the book and the reader is enlightened on the life and principles of Chanakya who went on to pen his seminal masterpiece ‘ Arthashasthra ‘ later in his life . Chanakya was one visionary who , roughly 2300 years ago , revamped the realm of downtrodden governance with his astuteness and acumen . 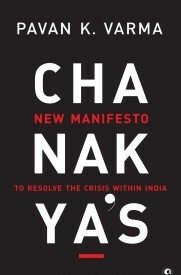 The author intends to step into Chanakya’s shoes and review the magnitude of problems carving our society and by doing so , brilliantly comes up with a manifesto which if utilised in its prescribed manner would see the inception of a much needed change to revive our country . 1 ) The Cover : The reader is welcomed by a modest cover design which hints about the gravity of the content and the brief note on the author speaks volumes about his glorious past , be it his academic history , his professional legacy or his highly acclaimed literary life . The reader’s interest is sure to be piqued by the charming welcome the book offers . Each chapter begins with a brief albeit profound message , rather tactics , adapted from Arthashasthra which enlightens the reader on how the author’s new manifesto is based primarily on Chanakya’s principles . The author , with remarkable prowess delves into each section , at first speaking in length and breadth about the intensity of the issue plaguing the particular division and thereafter unveiling his manifesto to undo the damage and to reconstruct a more promising scenario . It is laudable the effort taken by the author to dig deeper into the country’s past so that he could arrive at a convincing and conclusive report on the facts leading to the bigger issues . However , the portions where the author deals with the vagaries concerning the judicial machinery did seem a bit cloudy for me and I suppose it would so for the common man otherwise unexposed to the subtleties of judiciary as well . But then I am sure those contents were knitted there in the first place aiming at the concerned people who would imbibe the assertions in the right sense and debate further on it . So no complaints . Likewise the author has strewn together meaningful nuggets throughout the book which serves to open the minds of the readers to the stark realties in its utter rawness . Certain numbers detailed are of alarming amounts that one cant help but sit back and wonder about the gravity of the crisis . According to him , the crux of the whole crisis lies on a redundancy dominating our machinery which inturn restricts the further expanse of our glory even when the truth remains that India is one among those few countries blessed with abundant resource . Truly speaking , I find it impossible to pick out any particular portion or idea illustrated to declare it the best . Every single bit of thought included in the blueprint deserves to studied in depth . Humble enough , the author himself considers his set of ideas a mere rough draft which needs to be evaluated under the microscope shred by shred , such that a polished blueprint for change is eventually created . At one place , to tackle the political hooliganism the author prescribes a measure in which the political parties are mandated to disclose their monetary funds and criminal records of candidates if any , prior to the election . The voters should be empowered such that they are given an opportunity to evaluate the skills and prowess of the candidate based on meaningful debates between the opposing candidates . He stresses the urgency for encouraging the moulding of an inclusive society by incorporating the service of NGO into the state machinery such that the process keeps up its steadfastness . He also speaks in depth about the insensitiveness shadowing our society , the result of which is the reluctance of the privileged to support the poor and the upper caste to acknowledge the backward . The inconsideration shown to farmers by neglecting the field of agriculture is also dealt strongly . They say , when the book is enriched with content few would dissect the literary quality with criticizing eyes . The author is sure to satisfy the scanning eyes of the critics too with his commendable hold on language . The writing is lucid and every bit engaging . Typos hide at a couple of places which are almost unnoticeable . My suggestion is that this book ought to be distributed among the civil servants , politicians and bureaucrats at the helm such that they are offered the much longed for correction of their myopic vision . Perhaps inclusion of parts of this manifesto in the high school syllabus would even prove fruitful . All in all a riveting read . This review is a part of the biggest Book Review Programme for Indian bloggers by Blogadda.com .Participate now to get free books . Many thanks to Blogadda for having let me review the book ! This review has been shared by Aleph Book Company . Find Here . Very nicely reviewed! Couldn't have been better! Before going up to something spectacular it's said…it's always advisable to get a review of things…as i am going to review this book very soon…and your take on this mesmerizing my views…!!! thanks for this wonderful review and now i am much more eager to get hold of this book! Your review is a reason enuf to read Malini. I agree with so much in here… I am about to wind up the book and there is so much to absorb in here that I do not know how to review… Nicely done by you…There's actually so much to take from the book and very rightly suggested it much be sent to the people who need it asap… Including it in the curriculum is another good option. Had not thought of reading it. But now, perhaps, I may.